It's Spring Break where we are, which would mean getting out and enjoying the sun, except this is Oregon and it comes and goes. Time to make stuff! I was introduced to a technique a few years ago that we used today on t-shirts. It only requires a cotton t-shirt, freezer paper, a fine-tip Sharpie and crayons. Perfect Spring Break project. I am a big Wonder Woman fan. I think I got over actually wanting to BE Wonder Woman. Sort of. But I still like to collect stuff with her picture on it once in a while. I knew I wanted to write about the crayon t-shirts, so I went to deviantART to find an appropriate picture to use. If you haven't visited the website before, you really should. A lot of very talented people post their art to view and purchase. Some people will allow you to use it without a charge. I found a cartoon drawing of Wonder Woman that I loved, so I contacted the artist and got his ok to use it and post it here. He has several other superheroes he's drawn, including the Batman that Codi used on her shirt. You can see his portfolio here. Be aware, deviantART is not always kid or office friendly, but they're pretty good about blocking questionable material unless you request to see it. I've lost an hour or two of my life to this site. So, before you start on the shirt, you need to wash it. I learned (the hard way, like always) the type of t-shirts they sell at the craft store work best (Hanes, Fruit of the Loom, Gilden). I tried this on a softer, girl-cut and it was too stretchy and kept coming loose from the paper. You'll also need to print the design you want to use. Pictures from coloring books or a similar style work well. I print two copies so I have one for reference while I trace the other. After your shirt is washed, iron a piece of freezer paper larger than your design to the wrong side of the front, waxy side to fabric. See, that freezer paper is coming in handy again! It helps to stabilize the shirt while you color it and keeps the Sharpie from bleeding through onto the back. Tape your design to the back of the freezer paper. Hang the shirt in a window, lay on a glass table with a light underneath or use a lightbox - whatever allows you to see through the shirt to trace your design. I found putting the shirt on a hanger and taping the hanger to the window worked well. 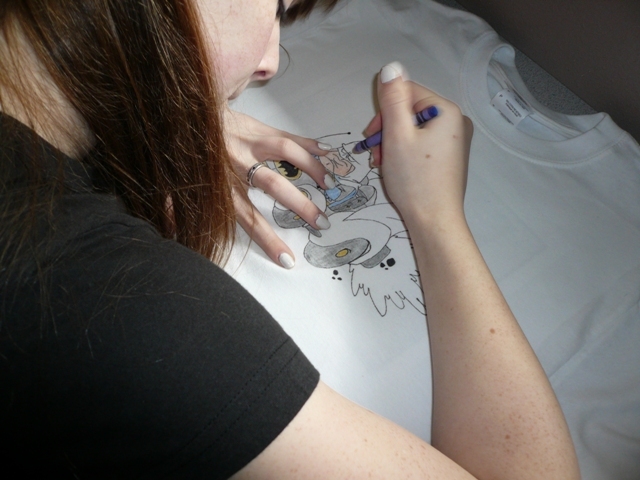 Trace over all the black lines outlining your design onto the shirt with a fine-tip Sharpie or other permanent marker. Don't push too hard so you don't drag the fabric free of the freezer paper. After tracing, lay the shirt down on a table and color in with crayons. Small details are best handled with a sharp crayon. A feathery, single-direction stroke will help keep your shirt stable. If it starts to pull away from the paper, fill in as best you can. You will be able to add additional layers of crayon if needed. Unfortunately, I managed to color outside the lines in a couple of places. In this case, that's not a good thing. Lay the t-shirt on an ironing board, colored side up. Place a sheet of printer paper over the design and iron. The paper will absorb some color. Repeat with new paper until no more color comes off. Repeat coloring and ironing process as many times as you'd like to get a color you're happy with. You can replace your freezer paper if it doesn't stick back down after ironing. We made these a few years ago as a party activity for Codi's birthday. I did the pen tracing prior to the party and the girls colored them. It hasn't been very long since I've seen one of the girls still wearing hers. You'll have to excuse me now, I have to be off...the invisible jet is waiting.